Abandoning the traditional clamshell form, the Wind U160 ushers in a new era of netbook design. From the illuminated MSI logo on the netbooks outer surface to the power button placed on the U160s cylindrical hinge, the newest Wind model sports a slim new footprint. Just 0.98 inches at its widest point, the U160 is the thinnest Wind model to date. The units raised chiclet keyboard and seamless wide touchpad increase both accuracy and comfort while typing. The U160 is available in a fashionable sparkling gold or a more formal black, and its Color Film Print finish gives it a sleek stylish new look. 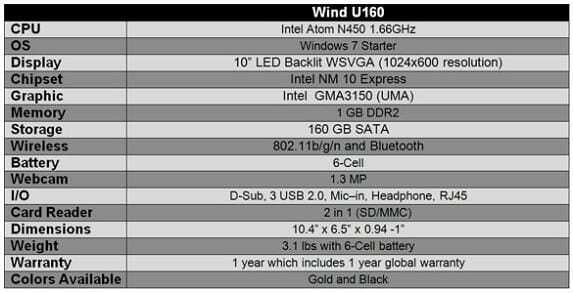 The newest edition to the Wind family will also ships with 10-inch backlit LED display, 1 GB of DDR2 memory, a 160GB hard drive, a 6-cell battery, Bluetooth connectivity and Microsofts Windows 7 Starter. MSI also included its user friendly EasyFace facial recognition security software to help U160 users protect their information. The MSI Wind U160 costs just $379.99 and is available now at Frys (Frys product number L1600) and online at Newegg and Buy.com. Based in City of Industry California, MSI Notebook manufactures and sells a wide array of mobile computing products that includes Gaming Notebooks, the X-Slim line of ultraportables, the Classic Series Notebooks and MSIs award winning line of Wind Netbooks. Each product line is designed with the latest technology to meet a specific set of needs for the various classifications of mobile users. To learn more about MSI Notebooks complete offering please visit www.msimobile.com.